In 1957, the Willink Commission was established to look into the authenticity of the fears and agitations of the minorities and to find means of allaying their fears. 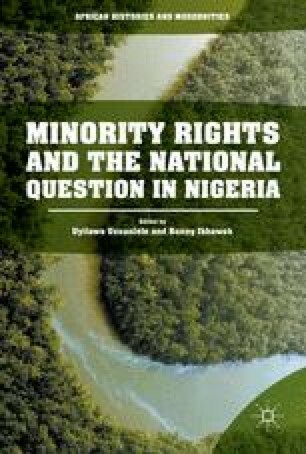 In 1958, the Henry Willink’s Minority Commission Report characterized the Niger Delta as infrastructurally and generally poor, backward and neglected, and advised the government to establish a Federal Board to address the problems of the area. Data obtained from primary and secondary sources were deployed to carry out the study using an analytical and narrative historical method. Findings indicate that despite the fact that the Henry Willink’s Minority Commission Report dates back to 1958, over 50 years after the Commission made its recommendations, the Niger Delta region is yet to witness the much-needed peace and the level of development as recommended. It is, therefore, in line with this that this chapter seeks to examine the recommendation(s) of the Willink’s report vis-à-vis happenings in the Niger Delta region, with the aim of making an analysis of the report and looking at as some of the issues which may have prevented the implementation of those recommendations as well as see if there is really any hope for the minorities of the region.